Our Fancy Goose package consists of rare and unusual varieties of geese, some of which are so limited in number that we cannot sell them as individual breeds, so we are offering them to you only in this package. Our choice of a minimum of 3 varieties from the following: Brown Chinese, Pilgrim, Buff, Roman Tufted, Tufted Buff, Super African. Sold as straight run only. Please note: We do not guarantee to include all breeds listed above. Only 3 breeds of our choice. Hello! Can I order few Chinese geese? 1 male and 3 female? 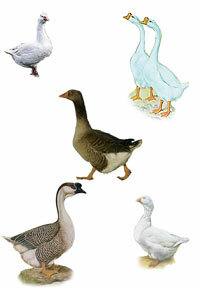 You can order individual breeds of geese, but they are sold as st run (unsexed) only. Straight run means the chicks are not seen by a sexer so are sold "as hatched or luck of the draw". No, it will not list what breeds are included in the package. It ships in groups of 10.